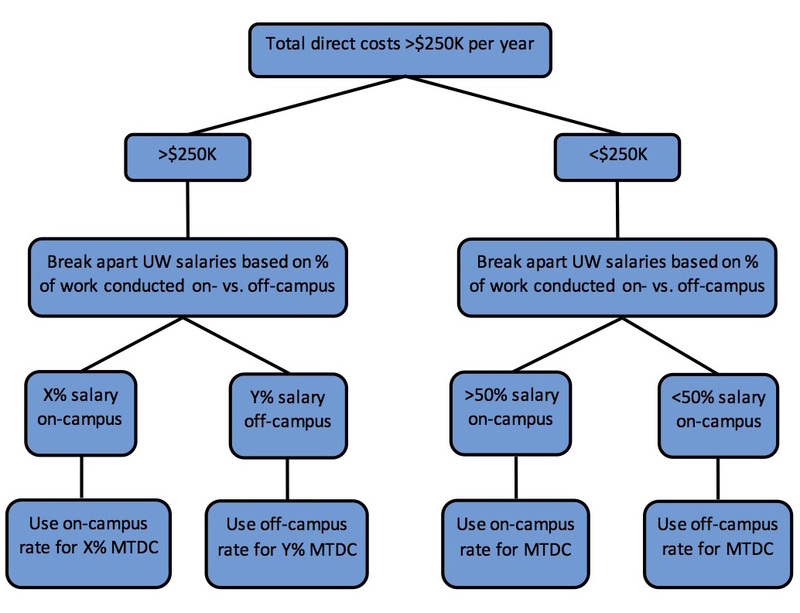 Please use this guide to determine whether to use the on- or off-campus F&A rates, or how to apply a combination of both, for your research proposal. Will all of the proposed work take place on campus? Campus includes UW Seattle, UW Tacoma, UW Bothell, UW Botanic Gardens, and Friday Harbor Labs. If yes, use the on-campus F&A rate. If no, go to #2. Will all of the work take place in leased space? Will the sponsor pay for the leased space? If yes, use the off-campus F&A rate. If no, use the on-campus F&A rate. Will all of the work take place in facilities provided at no-cost by a non-University organization? If no, go to #4. You have indicated that at least a portion of your work will take place away from campus. Where will off-campus activities take place? When will off-campus activities take place? If exact dates not known, provide duration(s) of off-campus activities (e.g., 15 days, 40 consecutive days/year). a. If total project consists of >30 days of activity conducted continuously away from campus (e.g. no travel back and forth), use off-campus F&A rate. b. If only part of project consists of >30 days continuously away from campus, are total direct costs >$250K in any given year? If yes, go to 4c. If no, refer to flowchart below. c. Can costs be assigned to specific locations? If yes, apply F&A rate corresponding to each location to the MTDC assigned to each specific location. If no, refer to flowchart below. If off-campus F&A rate is used, budget and justification should include support for off-campus activities (e.g. travel, per diem, lodging, rent). Research vessels have a specific F&A rate of 25% charged on salaries and wages while at sea. Subcontracts that will be charged F&A should be charged the rate for the location where the subcontract is primarily administered. The first $25K of any subcontract will be charged that F&A rate.